People love photos. We are more visual now than ever. With most of us using smartphones and digital cameras to share with the world everything from what we had for dinner to holiday and birthday memories. We snap, share and print more than ever before. All of this makes our choice of editing tools something worth thinking about. If you asked any Mac user what they use their computer for, editing photos would come near the top of the list.There are, of course, many tools you can use to edit photos on a Mac, including Apple's own Photos. Photos is a useful tool, with numerous features that make it easy to resize and retouch an image, or even a batch of images. But it is quite basic, compared to some of the other tools on the market. At the other end of the spectrum is the heavy-duty suite of Adobe Creative Cloud (CC) tools, such as Lightroom and Photoshop. However, not everyone needs something so robust, or has the time to learn. Not every Mac can handle the system requirements either. A happy medium is to look into a range of photo editing apps. We have included and cover several in this article, connecting them to various aspects of the photo editing process. This way, you get a feel how an app performs when undertaking something you do often when editing, or something you know you need help with. However, Setapp includes all best tools to take your photo editing to the next level photo. Discover some of the best apps in the market, with mentions throughout of strengths and weaknesses. How to edit pictures on macOS? You can make your photos look better without diving into any third-party software. Apple’s native Photos and Preview apps have the basic functionality that could save you lots of trouble. You can take a picture and instantly enhance it in Photos – crop, adjust color, or apply filters. The Preview app has an in-built Markup toolbox with some solid photo editing capabilities. If you need to remove image background or do some color adjustment, this could be your perfect go-to instrument. But before entrusting photos to a default tool, define what has to be done. The chances are, Apple’s native software might fall short of meeting your needs. Getting pictures ready for the web often means cropping and straightening. If you need to get a whole group ready, and the changes are simple and easy to do, the native Mac Photos app can do this. To crop an image automatically or manually with Photos, open the photo and click Edit > Crop. Choose Auto for automatic cropping or customize aspect ratio if you want to crop a specific area. To manually straighten your photo, click Crop > Dial, and then adjust the area by dragging up and down. Also, look no further if your task is to rotate or flip an image. Once you launch Photos, choose Image in the top menu bar, and click Rotate clockwise/counterclockwise or Flip vertical/horizontal to apply desired changes. PhotoBulk gives you the advantage of real-time previewing for all photos in the set you are working on, giving you the ability to automatically edit, crop, watermark and straighten a whole folder of images in minutes. To crop your photos with CameraBag Pro click the Crop button in the right-hand toolbar (second from bottom). To straighten your image, drag the dial up or down. To crop the photo, drag one corner inwards, then drag the box around the image until its positioned the way you want it. Let’s say you want to set custom dimensions for 20 images. It’s very likely, your eyes might betray you if you go through them one by one. In the Preview app, you can batch resize any number of photos without even opening all of them. Drag images onto Preview icon in your dock and select thumbnails for all by clicking Edit > Select All. Set any dimensions and press OK to see your photos in the new shape. Back when print film was the only option, waiting for and chasing the light was a challenge every photographer had to struggle with. You could make some changes after a picture was taken, when they were being printed. But you had to be careful. Print film was expensive and you couldn't afford to take dozens of the same shot. Now you can do a lot more with pictures after they're taken. Editing software won't turn a poor picture into a Pulitzer prize winner, but various apps can be used to improve and enhance the lighting of a picture. Within Photos, for example – Apple's native images app – you can make some changes to the light levels and overall warmth of an image. To quickly fix exposure, brightness, and other lighting values, click Edit and start adjusting by moving sliders to the right or to the left. TouchRetouch - Includes a range of tools for selecting areas you want to erase. TouchRetouch is also great at making color adjustments to your photos to ensure that your final edited work looks the way it should, which includes lighting changes. PhotoBulk - Mentioned earlier in this article. It can apply lighting adjustments to a whole folder of images in only a few clicks, taking a matter of minutes. Useful if you're someone who regularly needs to make simple, quick adjustments to large numbers of pictures with a short turnaround to think about. 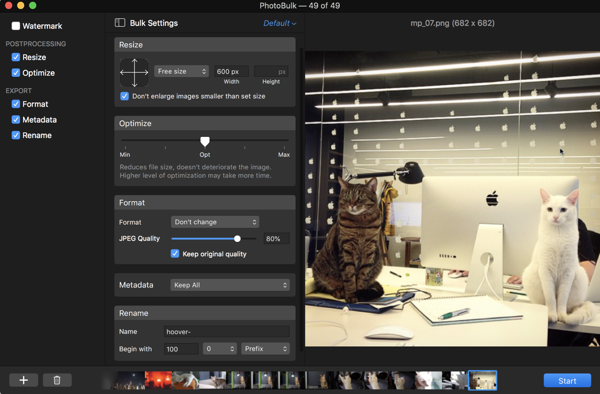 Photolemur - an AI-powered photo enhancer that automates the editing process. This is the first photo enhancer that can actually think for itself. You don't need to learn what the pros know and you don't need to spend hours messing around with sliders and editing every image manually. Using 12 smart AI-powered technologies, Photolemur identifies then makes changes to images, including adjustments to lighting, colors and exposure. Click the Adjustments tab on the right-hand toolbar (first from the top). The color adjustments are grouped at the top and the lighting adjustments are below. Drag the slider in each adjustment left or right to change its value. Scroll further down and you'll see options for adjusting hue and saturation and for using curves to adjust highlights and shadow. To use curves, click on the Curves tool, choose whether you want to apply the change to all channels or only the red, blue or green channel. Then, when the curve appears, drag the points on it up or down. Tip: you can undo any change by pressing the Off icon in the bottom toolbar. You can also undo anything pay pressing Command-Z. Imperfections spoil perfect pictures. It doesn't matter if its dirt or rainwater on a lens, or background distractions such as rubbish or graffiti, it can make it harder to get an image ready to be published or printed. Thankfully, almost every photography app comes equipped with features that make it easier to erase or clone out imperfections of any size. Apple's Photos app includes a healing brush and red-eye correction tools that enhance your images. To quickly retouch, click on the arrow next to the bandage icon, customize the size of your brush and apply it to a specific area in a photo. For red-eye correction, use the same logic or choose auto-correction. There's another option, great for beginners: TouchRetouch. It comes with a wide range of easy-to-use features that help you identify and remove imperfections. Including a single click tool for blemishes, and a clone stamp to copy pixels from one part of the picture to cover an imperfection you want removed. You can also crop a section of a photo if it proves too difficult to clone pixels. You can apply some basic sharpness adjustments and reduce noise in Photos. The same Edit section we’ve discussed previously comes to help here. Upload your photo and click on Noise Reduction – you can either choose auto or customize the value by moving the slider. In the Sharpen section, set custom values for Intensity, Edges, and Falloff. CameraBag Pro is also useful for making images sharper. It comes with an adjustment tool that identifies where changes are needed within a picture, remedying them automatically. When making changes to sharpness, you need a tool and a screen that is configured to what your eyes see. A powerful graphics card and high-resolution screen is a must if you are doing this professionally. With the right app supporting this work, they can spot imperfections that you might miss. Producing sharp images has become a necessity when everyone is equipped with smartphones that come equipped with HD screens. Emulsion is another option for this. Built for Mac users, giving photo editors a powerful and usable creative workspace for enthusiast and professional photographers. When making edits to photos, the color balance is worth reviewing to ensure some areas aren't too warm or cold, depending on the look you are aiming for. This is something you can change using Photos. Once you open your image with Apple’s native app, click Edit and scroll down to SelectiveColor. In the drop-down menu, you can adjust Hue, Saturation, and Luminance, as well as customize a range of colors, based on your preferences. More conveniently, you can make changes as part of a series of edits within other photo editing apps, such as Emulsion. Emulsion provides an immersive environment, created by photographers. Different areas of the picture can be made warmer, colder, brighter or darker - making small but necessary changes to enhance the original image to stunning effect. Long before Instagram was popular, photographers have always been keen on using filters. Some of the most basic could apply the warmth of a sunset, or the grainy impurities of older film cameras to modern images. With the right tools, you can do amazing things to images. Even make a picture look as though it was printed on metal. The easiest way is to apply filters in Photos. Simply click Edit > Filters and fit any of the suggested effects on your photo. The collection is pretty limited though. Some apps are more equipped than others for applying filters and special effects. Photolemur can also make enhancements and apply color and texture changes to single or whole batches of images. It can even enhance the color of foliage and the sky. CameraBag Pro comes with dozens of filters, including black & white, classic photographic styles, grainy effects, mattes, vintage, numerous types of film stocks, and many more. Well worth testing out if you want to apply a range of styles to your images. And finally, you are going to want to make sure your images are ready for the web, commercial use, or printing. This could include watermarking them to protect your creative and intellectual property. Thankfully, photo apps often give you the ability to ensure RAW files - after edits - are turned into high resolution or web versions (where the file size needs to be much smaller) - and watermarks are applied. Photobulk can add watermark to portrait, landscape, and cropped photos in a single batch. Once you’re done with editing, you can Save or Export your image from Photos to desktop. To bring it back to your Photos library, click File > Import or simply drag it into the app. What is the best app for photo editing? Every app we've mentioned here has several features worth recommending, including Photos. What you choose partly depends on what you need and how familiar you are with photo editing software. Here is how we would classify the apps mentioned in this article - all of them available from Setapp - alongside Photos, a Mac tool available on every macOS device. Quick and simple: Photos - for a basic tool that can make a few changes, we would always recommend Photos. Accelerated editing and resizing: Preview. This native app is mainly known for its Markup toolbar – an easy access to basic color adjustment, cropping, etc. Also, the app batch resizes tons of your photos lightning fast. Robust, ideal for professionals: CameraBag Pro. Described as the ultimate tool for bringing both advanced adjustments and one-click filters to your photos and videos. A photographer's and filmmaker's dream. Emulsion comes a close second in this category, providing photographers and film makers with an immersive environment to work on your images, with an interface which scales from small laptops to professional 5k workstations. AI-powered, smart automated editing: Photolemur is capable of taking away the strain of manual photo editing. It can produce better lighting than the original image, make quick enhancements, and keeping you in control. On the other hand, Photolemur analysis images with 12 smart technologies that can automatically make adjustments to pictures. Removing imperfections: TouchRetouch is an ideal option. Bulk edits: Photobulk and CameraBag Pro. Discover all the 6 best photo editing apps, available for Setapp members - this is a quick way to weed out which app is right for you. TouchRetouch, an app to remove unwanted objects from any photos with the absolute minimum of effort. and whatever you think that is spoiling your photos. CameraBag Pro is the robust editing app to apply, tweak, and compare professional filters and adjustments across your photos. Photolemur, an AI-powered photo enhancer that automates the editing process. This app makes almost any photo look better without manual editing, as well as allows to automatically enhance a batch of images at once with drag-and-drop simplicity. The app has 12 smart technologies ranging from color recovery and exposure compensation to smart noise reduction to automatically analyze and adjust your photos. Photobulk, an app for batch editing: add text/image watermarks, rename, resize, compress photos, and optimize them for the web in a click. It can be a hard choice, and different photographers - amateurs and pros will have different opinions on each app. It could be worth downloading a few from Setapp to find which you prefer, trying out different features on various aspects of photo editing.